Economical fly protection that's easy on sensitive skin. 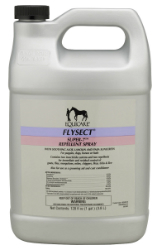 Provides immediate and residual insect control while moisturizing the skin for show coat condition. Ideal for frequently washed horses . Not oil-based, so it won't attract dust. Lanolin, Aloe Vera, and PABA sunscreen protect sensitive skin. Apply every 5-10 days to maintain control. Effective against stable flies, houseflies, face flies, gnats, mosquitoes, mites, chiggers, and lice. Safe for use on horses, foals and dogs.